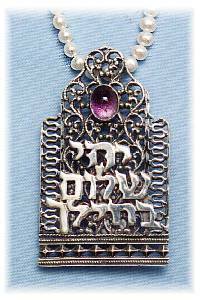 This beautiful Sterling Silver, filigreed pendant is decorated with the Hebrew verse from the Psalms; "Peace be within thy walls." It is graced with a semi-precious amethyst. with a pearl necklace for $120.